If you’re like me, looking to build a house on your own, then the following should come as no surprise: In order to construct a new home, I first off have to know my strengths—and areas where I need to rely on experts and specialists instead. For instance, I know what I want my home to look like: two floors, an open kitchen, north-facing windows and an oversized deck. But I don’t really know how to go about building it to make this desire a reality. Sure, it’s possible that I might be able to cobble together something liveable over many years and many attempts, but the electrical would be shoddy (read: dangerous), the coveted second floor wouldn’t exist and the roof might leak. All things considered, it wouldn’t provide my family with the outcome I have in mind—and so, I’d turn to the experts. The same holds true when it comes to investing. You might know what you want your portfolio to look like—and what outcomes you want to achieve—but how can your portfolio be designed in a way that helps make these outcomes a reality? At Finsec Partners, we believe that, similar to how you’d leave the construction of your home to the experts, the build of your portfolio should likewise be managed by a team of specialists—each of whom plays a vital role in helping you best achieve your goals. Let’s walk through what we see as key roles needed to fill out this team of experts. First and foremost is the adviser. We believe it’s best when clients work closely with an adviser who serves as the principal architect to their investment plans. As an adviser, we believe you should first assess the needs and goals of your clients and explain to them the best way to help achieve their plans within the necessary timeline. Then, gathering these needs together, the next step is to work with the investment team and their chosen asset managers — in housing speak, a general contractor and engineer. It goes without saying that not everyone is an expert in every asset class. This is why we our advisers turn to our Investment Committee at this stage. TheInvestment Committee meets regularly to identify the experts and specialists—independent money managers from across the globe with the potential to outperform — necessary for the build of the portfolio. Think general contractor. Secondly, they bring all these pieces together to help design a portfolio that best aligns with the desired client outcome. Think engineer. We see one of the responsibilities of the general contractor role as vetting each manager and asking them to do a very specific job for each portfolio. It may also be helpful, in our view, to pair together managers who might work in the same space—but whose strategies complement each other—to help enhance the potential outcome. In addition, we believe it’s crucial to make sure that the specialists hired do strictly the work they’re brought in to do—in similar fashion to how a house comes together, piece by piece. Just as you wouldn’t want an electrician doing the plumbing, even if he/she insists they can, you wouldn’t want a U.S. large-cap equity manager doing fixed income selection. Ultimately, when it comes to portfolio design and implementation, we believe it’s mission-critical to find the right person for the job where her or his expertise is best utilised. Finally, any good general contractor will make sure that a project stays on track. We see the role of the Investment Committee here as the same. We believe that in order to help ensure that the build of an investment portfolio stays on course, it’s a good idea to routinely review both risk and performance, in order to help your clients reach their desired outcomes. Once a house is built, and things are in place, you’ll want to keep it in tip-top shape. Of course, in order to do this, routine maintenance is a must: the grass will need to be cut, air filters changed, gutters cleaned, and should a hail storm come, the roof fixed. In a similar vein, just because you’ve selected an investment strategy, it doesn’t mean that the work is done. We believe that if you want to help your clients reach their goals, review and maintenance is essential. 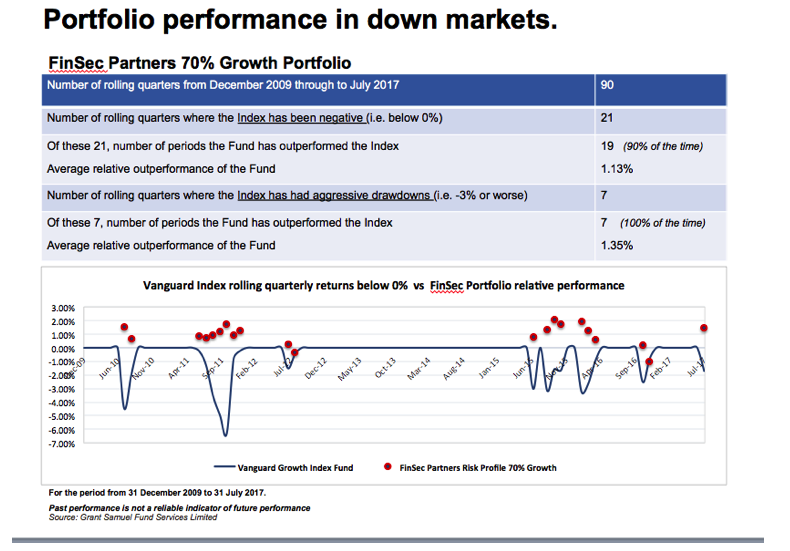 Complacency, in our view, has no place in portfolio management. The Investment Committee constantly monitor personnel, performance and investment styles of money managers in order to help keep investments on target. Of course, sometimes the goal posts move. The outcome desired a year ago may no longer be suitable. We get it. After all, life is constantly changing. Continuing with our housing analogy—maybe you welcome a baby into the family and need another room added on to your home. Or, ageing parents come to live with you. Whatever the reason, the house as originally built is no longer suitable. In similar fashion, your portfolio needs are bound to change—and as the adviser/architect, we believe it’s imperative to adapt a portfolio to meet any new objectives. This may mean taking into consideration growth and wealth preservation through tax efficiency, or retirement income needs, for instance. The makeup of housing can vary far and wide, but your home is best when it’s specific to you. Likewise, each client is different and has his or her own custom needs to meet. This is why we believe that taking each client’s investment plan and tailoring it to what matters most—client-specific outcomes—is ultimately a best-practices approach.